Evidence suggests a patient achieves better health outcomes if they receive continuity of care (Barker et al., 2016). Meg is living proof. Meg was diagnosed with Chronic Obstructive Pulmonary Disease (COPD) – a condition that if not managed properly can have life debilitating consequences. Meg’s condition was progressively getting worse and her quality of life was deteriorating. Meg’s daughter moved in to assist with all activities of daily living and was on track to becoming her fulltime carer. She described this time as a challenging and negative period in her life. Meg needed to visit her regular GP, but she found they were on annual leave. As Meg did not want to travel too far from her home, she decided to visit another general practice nearby. This practice was following the PCMH model of care which Meg was unaware of at the time. The moment Meg stepped into this practice, she noticed an immediate difference. The receptionist recognised her distress and Meg was seen by the nurse and GP promptly. Meg did not want to go to emergency, so they listened to her health concerns, put her on oxygen, and soon her breathing improved. The practice nurse Kath became her primary contact and she referred Meg to the appropriate health services that could assist her in better managing her condition. The PCMH team empowered Meg to be at the centre of her own care and encouraged her to take proactive steps to manage her condition. Meg was referred to a local hospital to undertake exercise rehabilitation and sent to a specialist physiotherapist who focused on her breathing techniques to build up lung capacity. The team also arranged for an aged care assessment which provided Meg with a home cleaning service. Having this service meant that her home was cleared of dust and she could breathe more easily. Meg was now able to focus on her exercise regime and using a pedometer she could track her steps and improve her fitness. 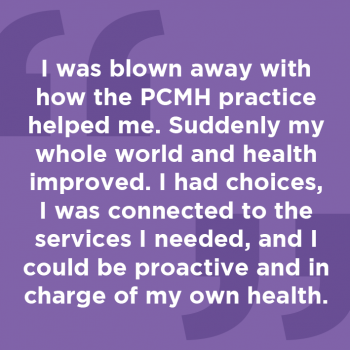 “I was blown away with how the PCMH practice helped me. Suddenly my whole world and health improved. I had choices, I was connected to the services I needed, and I could be proactive and in charge of my own health,” says Meg. “We want patients to see our practice as a place that has an open-door policy and looks at all factors of a patient’s environment that may impact their health. If we see the patient more frequently, we can assess what is happening in their life and together with the patient address the warning signs if something is not quite right. Meg is encouraged to visit our practice every three months to ensure she is doing well and staying on track,” says Practice Nurse Kath. Comprehensive Care: The Patient Centred Medical Home assesses the patient’s medical, physical, psychosocial and mental health needs, and focuses on prevention and wellness. This wholistic approach to care evaluates and addresses all aspects and environmental factors of a person’s life. Patient Centred: Meg is at the centre of her own care. A strong relationship is established between the patient, the general practice team, family and the wider medical neighbourhood. The practice has provided Meg with care that considers her needs, lifestyle, environment, culture and personal preferences. Together they have set realistic goals to improve Meg’s condition. Coordinated Care: The ideal medical home connects patients to the broader healthcare system and other community support services that bolster the well-being of the patient. For Meg, linking her into a physiotherapist, an exercise rehabilitation class at the local hospital, and home services contributed to better health outcomes. Accessible Services: Part of the PCMH model of care is to have accessible services and adopt an approach which ensures patients can receive care when they need it. For Meg this meant being able to have a chat with someone who is part of her care team when she needed to. Meg is encouraged to come into the practice every three months to review her care plan, and ensure she is keeping on top of her health goals. The care team is also available to see Meg at short notice if required. The practice has given Meg the tools and confidence she needs to better manage her COPD and enable her to live a healthier and more independent life. Barker, I., Steventon, A. & Deeny, S. (2016). Association between continuity of care in general practice and hospital admissions for ambulatory care sensitive conditions: cross sectional study of routinely collected, person level data. British Medical Journal.